It’s tough being the youngest in a household of six. Sure I was the baby of the family, but it wasn’t always easy getting my voice heard. What’s my point? You didn’t even let me get to the punch line at the end! But looking back, I can see that my brother was just preparing me for communicating with the masses in this age of instant information. 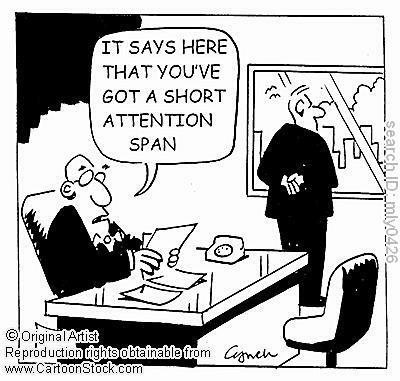 According to statistic brain, the average person’s attention span is eight seconds (thanks to the internet). That’s one second less than a goldfish! The data is actually from 2012, so the human attention span could be even lower now. That’s why in internal and external communications, it’s so important to reveal what matters to your audience within the first few seconds. Get to the point and stop dancing around the issue. I’m not going to list a number of ways to help you accomplish this because there’s only one rule of thumb: write messages that you want your viewers to read as if they will only read the first two sentences (because chances are they will be). Don’t forget about the eight-second attention span. That means in the first sentences of a newsletter or press release, the main point should be already made. That means creating a real e-mail slug line and not using such generic titles like “Update” or, even worse, “Untitled”. You may not think it’s a big deal; but trust me — your colleagues, employees, and/or general public will thank you for saving their time! I am confident that conscious awareness of my learning style as a facilitator can most certainly influence my facilitation of the learning process. I am a very visual person, and as such, tend to design my training around presentations that are visually stimulating. I am also kinesthetic, so I enjoy group activity and stories and videos that touch my audience. With that said, I try to remind myself that my learning style isn’t the same as others. I realize I am visual/kinesthetic, but know my participants will vary in all sorts of combinations and styles. I have learned to not try to coerce a person with a dominant style to engage in an activity that will cause them more stress than learning. That is not to say I do not encourage them at all — I just try to not be pushy. The key, I think, is to not gravitate to a radical extreme. As a facilitator, attempt to incorporate visual, auditory, and kinesthetic elements into all aspects of your training activities. Don’t be afraid to think outside the box. If your presentation is primarily lecture (auditory), then plan a small group follow-up discussion and ask people to diagram what they learned (visual/kinesthetic). 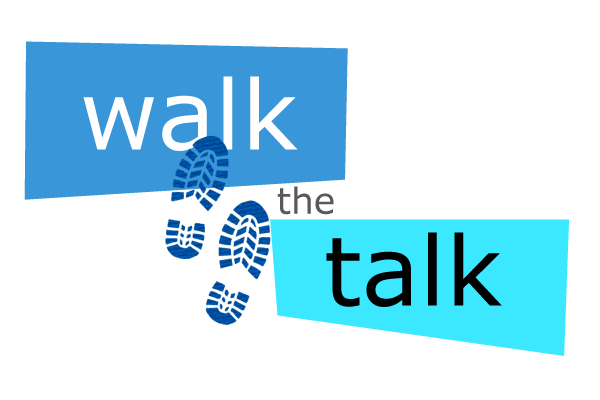 If your presentation is video-based (visual), then plan a written exercise (kinesthetic) or exit interview (auditory) to reinforce what participants learned. By not gravitating to a radical extreme and consciously paying attention to the various learning styles represented in your employee pool, you set yourself and your organization up for successful transfer of knowledge. This month’s Leadership Journal coined the phrase “twagedy” as a poorly considered tweet that ends up with tragic personal consequences. Just this week, a story broke regarding a New York Fire Lieutenant who had tweeted racially biased tweets, which then got retweeted and took on a life of their own. Yesterday, his story was carried in the British newspaper Mail Online, in which the lieutenant was described as having broke down on the street when confronted about his racist tweets. His photo ran on the front page, and as he sat crumpled on the curb of the street with tears streaming down his face, he said, “My life is ruined. I am so sorry.” His racist tweets are searchable and discoverable on the internet forever, and they will haunt him forever. From now on, prospective employers who do media searches will find his racists tweets, and he will be radioactive for the rest of his career. High-profile people have always been susceptible to saying stupid things that got them in trouble. But in today’s social media world, even a “normal” person can attain notoriety for saying or doing stupid things and sharing them electronically. For local government leaders, it is even worse as the media and political opponents lay in wait for something embarrassing to be said or done that will become headline worthy. In my previous life as a city manager, council members often asked what the rules were when they were traveling on city business or attending a conference. I always told them the same thing, “Assume that Fox News is following you around with a camera. As long as you only do things that you don’t mind explaining on Fox News, you will be just fine.” In today’s internet world, the standard is still the same, but how to apply it in practical terms is a bit different. 1. If you are not prepared to explain it to Fox News, don’t tweet it; don’t email it; don’t post it on Facebook; don’t say it. 2. If it would not make your 12-year-old son or daughter proud of you, don’t tweet it; don’t email it; don’t post it on Facebook; don’t say it. 3. Remember the Six Degrees of Kevin Bacon: everyone in the universe can be connected in six degrees. In the internet world, this means that what you send to your friends will be sent to their friends, etc. By the sixth degree, Pope Francis is reading your discourse on red shoes and tall hats that you just knew was the funniest thing you have ever written. But by the second degree, someone in your community has received your discourse and is deeply offended and has started a Facebook page with a petition asking you to resign. 4. When someone has said or posted something that you get angry or passionate about responding to, type it out in a Word document and let it sit for 24 hours. When you come back to it, ask yourself if you still feel compelled to respond; and if you do, ask yourself if you still think what you typed out in the heat of the moment is the way you want to express yourself. Never ever respond electronically while you are emotionally worked up, no matter how righteous you feel. It is really quite simple. Treat everyone with honor, dignity and respect, no matter what, and you will avoid creating your own personal “twagedy”. 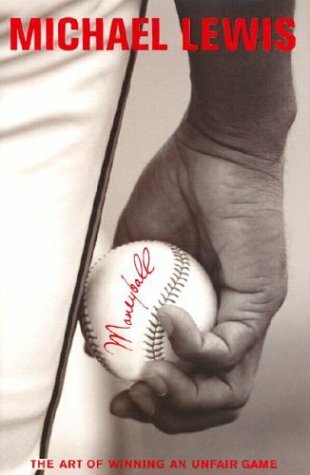 Moneyball is the story of how the Oakland A’s competed with the big boys by finding the rare talent, by crunching “different” numbers, and crunching those numbers differently. It tells the story of the 2002 Oakland Athletics, and how they genuinely competed (they won their division) with less money than any other team in their division. When you don’t have the resources, you have to go to plan B. The Oakland A’s found “undervalued players.” These players were still available because they did not fit the image of a baseball player. They were “unacceptable” to traditional baseball scouts, but their statistics demonstrated a mastery of the skills needed. There is a plan B that works, and you can find it if you look hard enough. Chances are it is not known by the “long-timers.” Chances are that you have to bring in true “outside help.” In the book, Lewis describes true, genuine changes – changes that affected everything about the way to look at a baseball team. Cities do not have the luxury of making decisions without hard numbers behind them. Numbers are more reliable than intuition, tradition, emotion, or… mostly anything! The aggregate is more important than the individual. What is done over all (together) is what the company needs. This book is a true story, but it is also one gigantic parable for anyone in business. Collect lots of numbers — the right numbers. Pay attention to those numbers. Know what numbers (and traditions) to ignore. Make the changes you need to make, no matter who opposes those changes. Work with what you can get, and then do whatever it takes to compete no matter how strange or how unconventional it seems. In my last blog, I wrote about the liberating power of self-awareness and the usefulness of self-analysis profiles such as Myers-Briggs, DISC, and my personal favorite: IOPT. IOPT measures how a person perceives and processes information. It is also very helpful when it comes to working with teams. It will help team members understand each other’s perspectives. Some people always seem to push the envelope on change. They have a million ideas, and they are dying to try all of them! But, that kind of “reckless” creativity drives other people crazy because they are more selective in the way they evaluate ideas. To them, an idea may seem “cool”; but if it’s flat out impractical, then why waste time chasing rainbows? Until team members can appreciate the value of another person’s perspective without feeling that it somehow invalidates their own viewpoint, that team will never be hitting on all cylinders. It will help team members understand each other’s motivations. Some people on a team are all about action. They seem to operate by an unwritten philosophy that says, “Do something — even if it’s wrong!” In contrast to them are the people who seem inclined to want to deliberate forever over everything! Sometimes they hold the team hostage through the “paralysis of analysis.” When these apparently opposing motivations clash, it can become a power struggle for control. It will help team members communicate better with each other. Teams that are made up of people with a variety of IOPT profiles often discover that they not only have a hard time understanding where others are coming from, but they also find it difficult to communicate with each other. One person wants details, details, details. The other one wants “the big picture”. Both feel frustrated. However, understanding a person’s IOPT profile quickly tells you whether he/she wants “details” or “highlights.” Mix that understanding with the maturity to realize that the burden of communication is upon the sender, not the receiver, and the table is set for real communication to take place. A team becomes a team when everyone is pulling in the same direction and nobody cares who gets credit for success. I am convinced that most team members want to pull in the same direction. They don’t care about getting credit for success, but they do need to be validated for their efforts. And that’s why understanding your team member’s IOPT profile really makes a difference. Stephen Covey said that effective people “seek first to understand, then to be understood.” It works, and IOPT will help you do it. Most of you guys probably already utilize e-mail blasts, e-newsletters, and the common social media sites (Facebook, Twitter, Pinterest, etc.) But after you see these stats, you may want to consider adding another one to that list. According to YouTube, over 800 million unique users visit its website each month. That’s compared to the reported 167 million unique monthly visitors Facebook gets and the 39 million unique monthly visitors of Twitter. If YouTube is shattering the leading social media website in the number of users per month, maybe it’s time for your organization to tap into it. And if your group already has a YouTube channel, make sure it’s being used correctly to reap the benefits. The purpose of YouTube is to share videos with the world. It’s not only about making sure your direct audience sees the message; you can also get great ideas by watching what other groups are doing or how they’re handling situations. Another plus—content is not expected to be posted as frequently on YouTube, so you don’t have to worry about uploading new videos every week. If you’re going to post a subpar video, don’t bother posting anything at all. You don’t have to invest in the most expensive camera. In fact, most people don’t know that audio is as important—if not more important—than the video. A viewer would likely stop watching a video due to bad audio quality rather than bad video quality. That’s why television stations can get away with airing Skype interviews. Bottom line: your video doesn’t have to be the best ever; but if it’s not very engaging, think twice about posting it (unless it’s something like an important speech from an official). A lot of viral movements have made their rounds on YouTube. Months ago, people were choreographing their own “Call Me Maybe” music videos; and recently, groups have been making their own renditions of the “New Harlem Shake”. 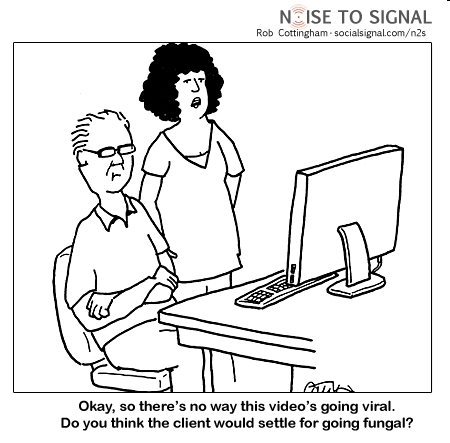 Don’t be afraid to hop on the next viral wave. It’s a great way to lightheartedly showcase your organization, but it’s very crucial to be punctual about it. If you post too late, you’ll be that out-of-touch group that laughed at the punch line too late. YouTube is a great tool to better the transparency and promotion of your organization. Plus, it’s free! Try it out and see how it works for you. Training and developing employees is not easy. It takes time, energy, commitment, and a skill set that includes facilitation ability, subject matter knowledge, presentation proficiency, and passion to see people succeed. But there is another aspect of training and development that is perhaps more critical than all those attributes combined, and that is practicing what we ask others to practice. This means ethics trainers practice ethical behaviors. 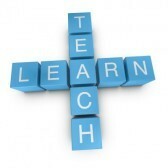 Those who teach leadership skills have tangible, validated leadership experience. Supervisory skills trainers do not live by the mantra, “Do as I say, not as I do.” Instead, they consistently model exemplary supervisory skills. A good presenter can read about what someone else has done and share that information with others. A good academician can study theory and hypothesize predictable outcomes. A good senior executive can endorse a development program or initiative. But practicing what we preach takes more than translating from one context or perspective to another. Practicing what we preach legitimizes our instructor credentials. When employees see what they are learning being modeled by those who teach or endorse what is being taught, the likelihood of buy-in and practice increases exponentially. The basis for buy-in is quite simple: “If I trust you, I am much more likely to follow you”. Practicing what we preach increases trust. Even if a mistake is made, part of practicing what we preach is owning the mistake, apologizing to affected stakeholders, learning and growing from it, then moving on. Effective trainers do not model finger-pointing. External blame bias is not in their repertoire. Coasting, slacking off, wasting time, absenteeism, tardiness, taking credit for someone else’s work, etc., are never used descriptively of an effective trainer because his or her number one priority is to model what he or she asks others to model. If that person is internal and he or she happens to not be a great presenter, think creatively. Ask your facilitator to video tape a conversation with them prior to, or interview them live within an instructional context. Invite them to write a case study. Ask them to pose several creative questions. Ask them to serve on a discussion panel. In essence – put stock in people who practice what they preach. By doing so, you will contribute to a culture of consistency and integrity. Servant Leadership — An Oxymoron? The tension is thick enough that the old cliché seems true – you could cut it with a knife. And the tension is seemingly everywhere. We are arguing over politics, labor vs. management, football concussions… the list is long and keeps growing. It’s time for some reminders from a true classic. If there is a shortage of leadership, what should that leadership be? What is leadership? The servant leader is servant first. It begins with the natural feeling that one wants to serve, to serve first. Then conscious choice brings one to aspire to lead. That person is sharply different from one who is leader first. The leader-first and the servant-first are two extreme types. The best test is: do those served grow as persons? Do they, while being served, become healthier, wiser, freer, more autonomous, more likely themselves to become servants? And, what is the effect on the least privileged in society; will they benefit, or, at least, not be further deprived? Acceptance of the person requires a tolerance of imperfection. Anybody could lead perfect people if there were any. It is part of the enigma of human nature that the “typical” person “immature, stumbling, inept, lazy” is capable of great dedication and heroism if wisely led. We are in dire need of pacesetters, at least one big one in each field. What if every person in a leadership position actually was “servant first”? What if their primary concern was that the people they lead “grow as persons”? I think this would make for a little better world, don’t you think? There was a time when I felt very resistant to personality profiles like DISC or Myers-Briggs. The way I saw it was that a leader had to be whatever he/she needed to be at the moment and that giving too much weight to profiles was too constraining. Now I see that I couldn’t have been more mixed up. At SGR, we use both of those tools; and we use another tool called “IOPT”, which stands for Input Output Processing Template. Are you systematic or unpatterned in the way you process information? Are you oriented toward contemplation or toward action? Self-awareness is liberating—not constraining. Understanding your preferences doesn’t mean you are incapable of looking at it in a different way. However, you probably have a “default” preference, and knowing it allows you to use it to your advantage. Self-awareness is liberating—for the people around you. There’s nothing right or wrong in the way you process information; but don’t kid yourself, it is affecting the people around you. By becoming more self-aware, you will see the emotional impact you are having on others. Believe me, they will be grateful. Does that mean I am incapable of the task at hand? No, it just means my normal way of thinking isn’t a recipe for success in this situation. It means there is another way to approach the situation; and if I can’t, perhaps others on my team can! Whenever I’m watching my toddler-aged nieces, I make sure they mind their manners. They’re great at saying “please” and “thank you”. And even when they have to be reminded, they quickly insert it politely. But there’s something about having to say “sorry” that makes their whole demeanor change. All of a sudden, they begin to hunch over, drag their feet, and in the lowest and softest voice possible, they say something that can be interpreted as, “I’m sorry”. Apparently, not much changes for some adults. 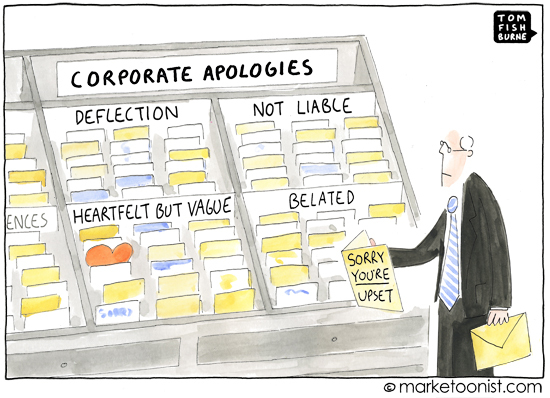 In the public and private sector, apologizing to the public still seems to be such a difficult task. It’s fun to brag about your organization’s accomplishments, but admitting fault? Not so much. From the Watergate scandal, we learned that it’s not the crime; it’s the cover up. When you find out about the issue, you need to start trying to rectify the situation. Hoping that the issue will get overlooked or eventually die down will only discredit your organization further down the road when the truth comes to light. We all make mistakes, and people know this. Be clear and specific about why you’re apologizing and mean it. Your public isn’t stupid — sounding a bit callous or pretentious isn’t going to work. Benjamin Franklin said, “Never ruin an apology with an excuse.” And he’s right! Don’t spend time trying to justify what happened. It’s time to ensure the public that you’re making strides to make sure it doesn’t happen again. If it hasn’t occurred already, a situation is likely to arise where you will have to apologize for your organization in some capacity, but it’s how you handle it that will determine a successful outcome.